Convenience is the key when it comes to safety during a storm. 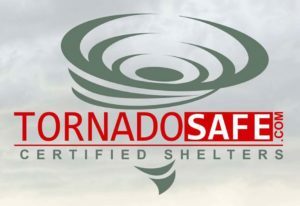 Our below ground tornado shelters are unique because they can be installed in your garage and don’t require the use of valuable square footage. Also, TornadoSafe shelters are out of the weather and out of harm’s way. Installation typically takes between 4-8 hrs depending on the size. All prices include delivery and installation within 75 miles of Sherman TX. Taxes not included. Additional fees apply for extra mileage, rock and soil removal. Small TornadoSafe Garage Floor Unit 3'x7'x4'6"
Medium TornadoSafe Garage Floor Unit 5'x7'x5'6"
Large TornadoSafe Garage Floor Unit 5'x8'x5'6"
Super Jumbo TornadoSafe Garage Floor Unit 5'x8'x6'3"
Small Concrete Slope Front Storm Shelter 5' x 7' x 6' 2"
Large Concrete Slope Front Storm Shelter 6’ 8” x 10’ x 6’2"